9959-KS-DST is rated 4.8 out of 5 by 55. Rated 4 out of 5 by kogepan52 from love the convenience of touch activation. Highly recommended for kitchen sink. I just wish the base is slimmer. Rated 5 out of 5 by Sheena from Looks Great I bought this faucet in the chrome color and we really like how great it looks. The On/Off touch functionality works really well and you can change the temperature or flow of the water without the faucet shutting off. I am glad that Delta put thought into that. One thing to note about the chrome is that when you do use the on/off touch feature your natural skin oils will leave imprints on the chrome itself so you will have to clean the chrome more than say, nickel. 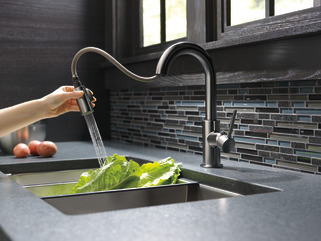 Rated 5 out of 5 by Dallas Girl from Delta faucet Love this faucet!! So pretty and works great!! Rated 5 out of 5 by None from Sink, faucet and drain I purchased all three items for my outdoor bar, they finished it off perfectly and function just as good. The turn around time was just a few days from order to in my hands. 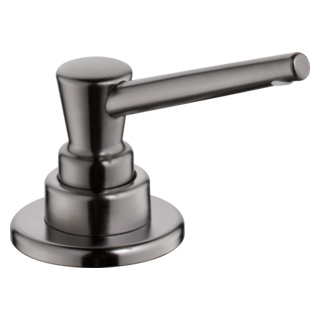 Rated 5 out of 5 by Dave 138 from I love delta service I purchased trinsic bar faucet 5 years ago. The hose started leaking recently, and I could not find the replacement part online. I called Delta service, they were very supportive, and offered to send the replacement part free of charge, under warranty. I’m very glad I called, instead of trying to buy the replacement part somewhere in the aftermarket world. The hose started leaking recently, and I could not find a replacement part online. I called Delta service, they were very supportive, and offered to send the replacement part free of charge, under warranty. I’m very glad I called, instead of trying to buy the replacement part somewhere in the aftermarket world. Thank you delta, I plan to be a loyal customer, because you have earned it! Btw, I love the faucet, other than the recently leaky hose, it has worked flawlessly. Rated 5 out of 5 by Bob from Fairhope from Love That it Matches The Sink Faucet! We bought both the kitchen sink version as well as the smaller bar sink version for our island prep sink. They look great together and work perfectly. The only design suggestion I would make is to scale down the diameter of the bar sink model to be more in proportion to its size. It looks a bit 'pudgy' for its height. Rated 5 out of 5 by DesignLovesDetail from Gorgeous faucet! I love that this faucet is as functional as it is beautiful. The champagne bronze is stunning. I’m an interior designer and have used this faucet in clients homes as well as most recently in my own home. 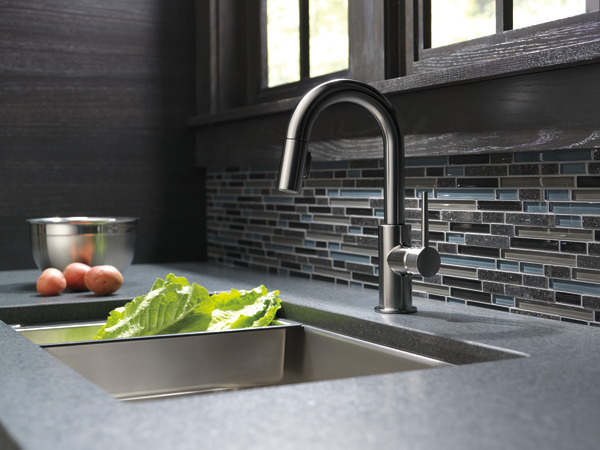 The sprayer portion blends in so the overall faucet maintains a minimal, sleek appearance which I love. the hole in the granite is only 1-1/4&quot; wide. will this fit? 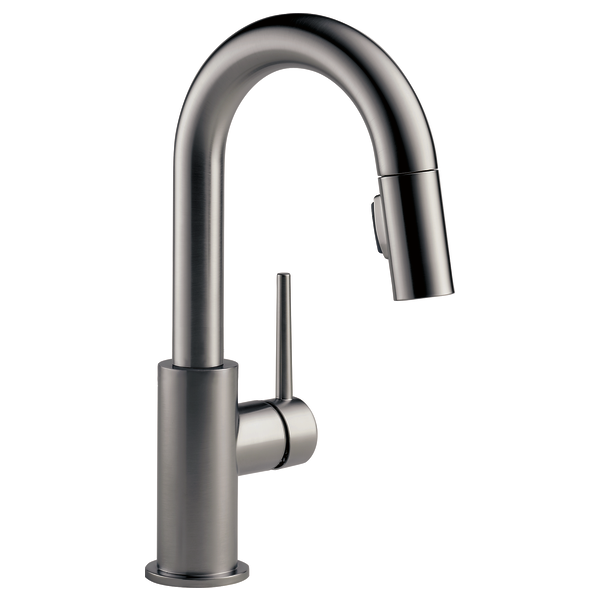 I have a question regarding the 9959-DST Trinsic prep faucet. Because of the location on my counter, I will have to mount the handle on the left, so I was wondering if the handle swivels the same amount back as forward (like 45 degrees each way). 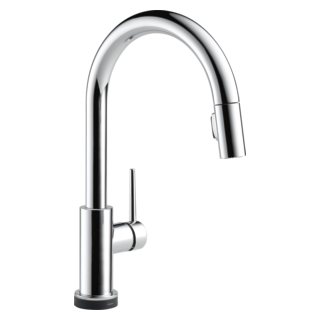 Does faucet 9959-cz-dst have hot and cold water? Thank you for your question. Delta Faucet model # 9959-CS-DST does have separate hot and cold water supply lines for the the faucet. Can this faucet be used in NYC? it shows the faucet has internal PEX components. Please advise. What would be the minimum sink dimensions this bar/prep faucet could reasonably support? 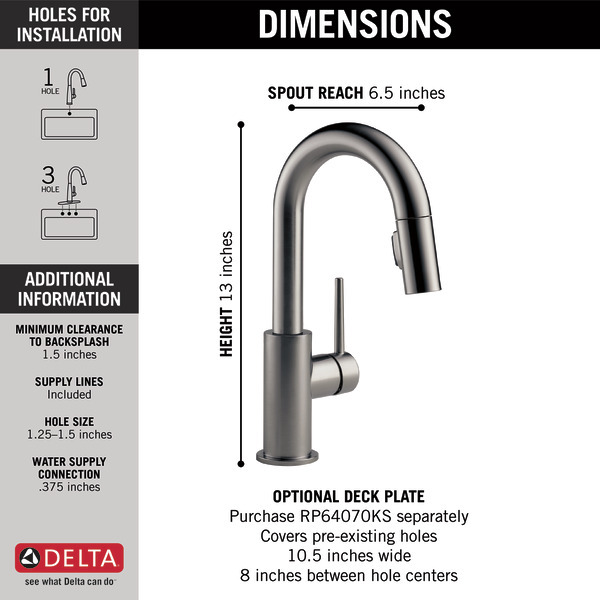 Does the Delta Pivotal escutcheon work with the Trinsic bar faucet? What is the color of the fabricated metal body of the faucet (not the exterior cover, but the internal actual faucet)? &nbsp;Your specifications say that it is fabricated from solid brass, so it must be gold/yellow in color - can you please confirm this? Is it possible to use the 9959 bar/prep sized faucet as a main kitchen faucet? Is 6.5&quot; spout reach too short for a 30&quot; undermount sink? 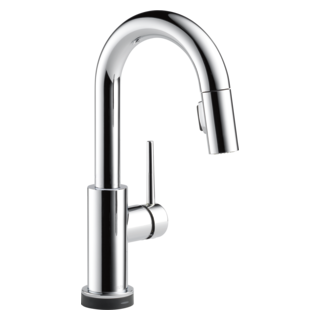 Besides size/dimensions are there any differences between the 9159 and 9959 Trinsic faucets specs or features? Thank you for your question. 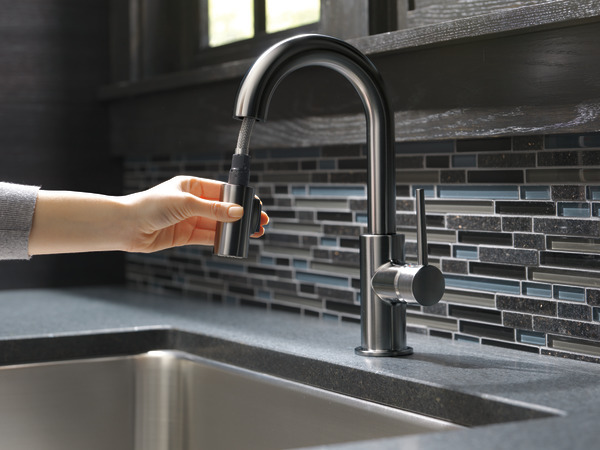 Delta Faucet models 9159-DST and 9959-DST are the same faucet with the 9959-DST just being a smaller version of the kitchen faucet. 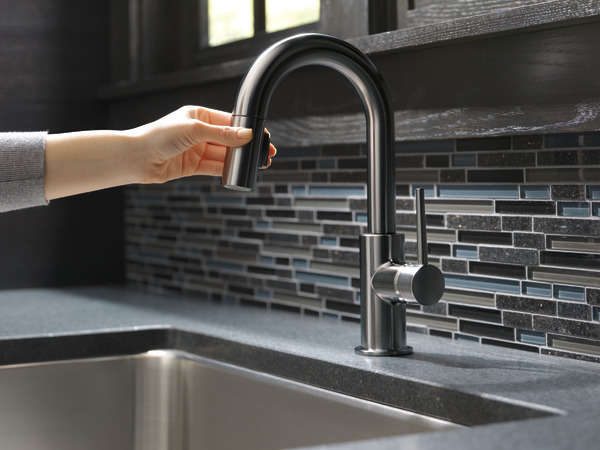 The only reason we would not recommend using the 9959-DST is it may not have the reach that you would like to all corners of the sink but that is a personal preference issue.